The Bodhisattva in gilt bronze is seated in the position of royal ease, with the left leg pendant and foot resting on a spiky double-petalled lotus; while his right foot is placed on a textured mat. The right arm of the figure rests on the right knee, and the slender fingers of the left hand are placed lightly on the trailing scarf; each wrist is enriched by a bracelet. The Bodhisattva's plump oval face is sweetly expressive with the small mouth set in a faint smile. The arched eyebrows, which lead to the narrow bridge of the aquiline nose, frame the downcast, heavy-lidded eyes. The neatly coiffed hair is secured above the forehead with a diadem and parts at the back into two tresses, each falling in three curling strands down the shoulder. 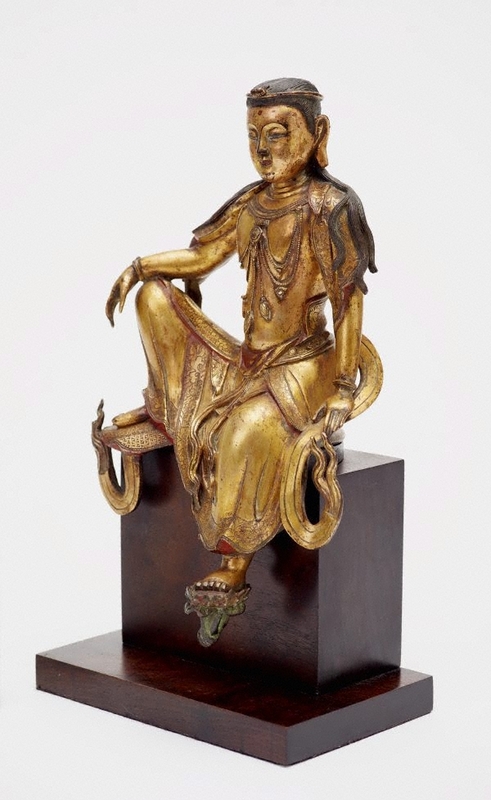 The Bodhisattva wears an elaborate necklace descending in two double loops down the bare torso while bud-shaped tassels emerge from a central rosette. The underskirt is finely incised with a border of floral scrolls and falls in folds down the lower leg. A knee-length overskirt, edged with a narrow band of flower-heads, is pulled up high on the small of the back, and falls open at the front; and another short garment is folded over the studded belt falling in folds between the legs. The shoulders are draped with a wide shawl, which is threaded through the arms and curves to the feet where it terminates in flame-like points. The gilding has an attractive reddish-gold tone with extensive traces of red pigment. 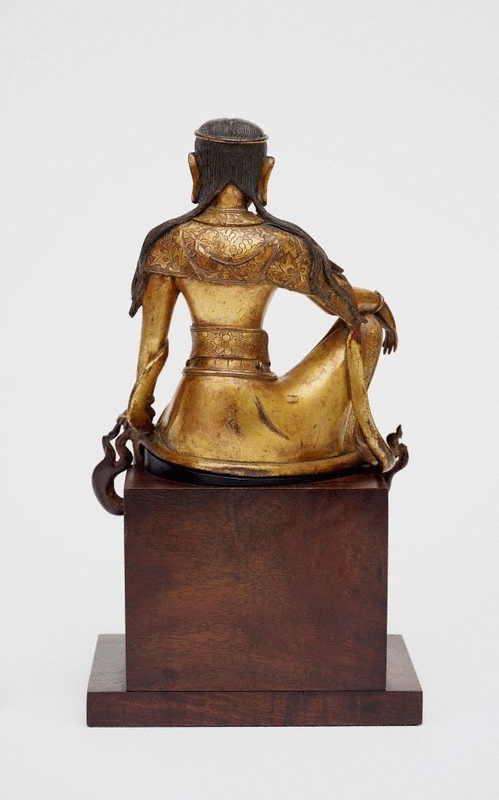 Gilt bronze Bodhisattvas in this position of "royal ease" (presumably originally resting on a rockwork base in gilt bronze, or in another material) are generally referred to as the "Water and moon" Guanyin, or the "Southern Sea" Guanyin, seated as if on the rocky shore of Mount Potalaka. 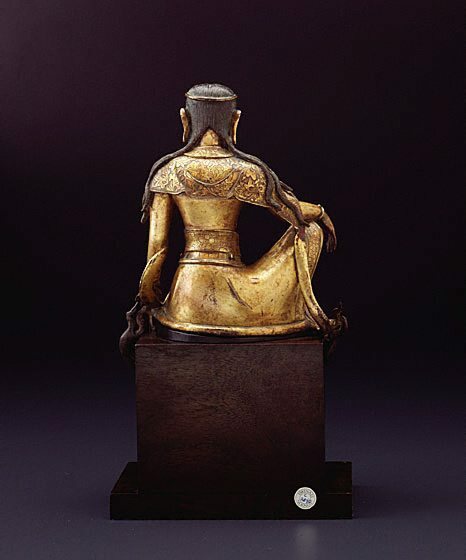 It appears that the image of the Water and Moon Guanyin is mentioned in painting records dating to the 8th-9th centuries, and it is possible that such paintings, which no longer survive, served as prototypes for sculptors. The earliest extant painting examples appear to be 10th century banners from Dunhuang. According to some scholars, the use of the "moon in water" metaphor for the transitory and unsubstantial nature of the world was common in Buddhist scriptures but there is no scriptural basis for linking Guanyin with these metaphors ('Latter Days of Law: Images of Chinese Buddhism' 850-1850, ed., by Marsha Weidner, Kansas, 1994, pg. 156-60). These transformations appear to have been a result of artistic innovation, or, more likely, based on sources outside Buddhism, whether from within or outside the Chinese tradition (cf. Derek Gillman, 'A New Image in Chinese Buddhist Sculpture of the 10th to 13th century', transactions of the Oriental Ceramic Society, London, 1982-83, pg. 33-44). Holland Cotter, The New York Times , 'Asia week, a vast concept embraced this year by Buddha', pg. E34., New York, 22 Mar 2002, E31 (colour illus. ), E34. This article appears in the 'Weekend, Fine Arts Leisure' section. Ann Macarthur, Look , 'Focus on faith', pg. 41, Sydney, Dec 2004-Jan 2005, 41 (colour illus.). Jackie Menzies, Look , 'Asian Favourites', pg. 24-27, Sydney, Apr 2003, 26 (colour illus.). 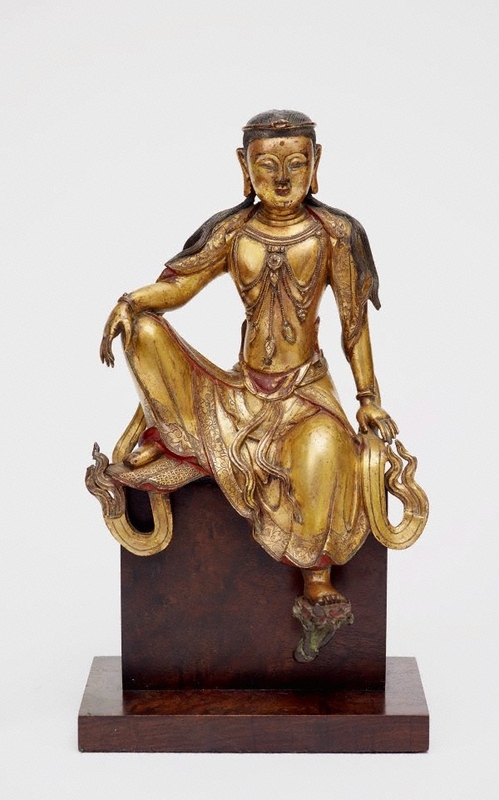 The Asian Collections Art Gallery of New South Wales , China 'Buddhist Art', Sydney, 2003, 96, 97 (colour illus.). Art Gallery of New South Wales Annual Report 2002 , 'Year in review', pg. 8-25, Sydney, 2002, 9, 17 (colour illus.). Art Gallery of New South Wales: highlights from the collection , Sydney, 2008, 169 (colour illus.). 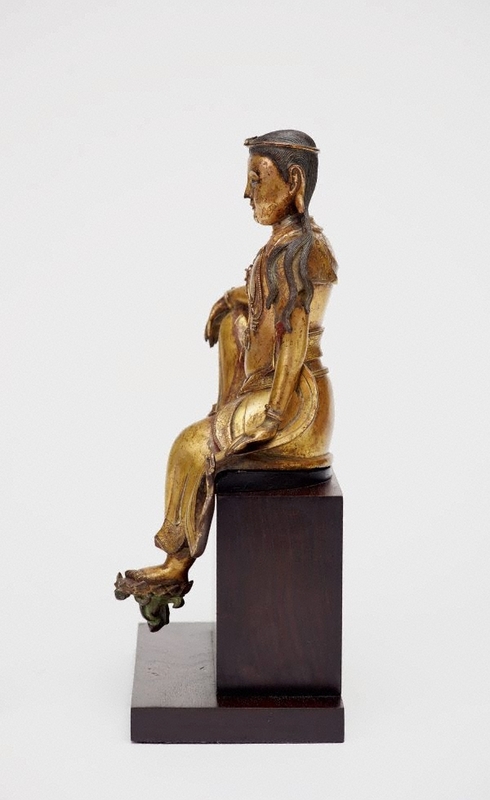 Chinese Buddhist sculpture from Northern Wei to Ming , London, 2002, 48, 49 (colour illus. ), 50 (colour illus. ), 51 (colour illus.). cat.no. 14 The two images appearing on page 51 are in detail.